Help save the planet by working for these top-rated green companies. Energy, recyclables, water, food—these are all things the average American wastes a lot. Take, for example, the average office worker, who uses 10,000 pieces of copy paper a year, with about 45% of it usually getting trashed by end of day, according to The Paperless Project. Now, add that up for every worker in your office, and it’s easy to see where all of our forests have gone. Fortunately, that’s not the case for workers at all companies. 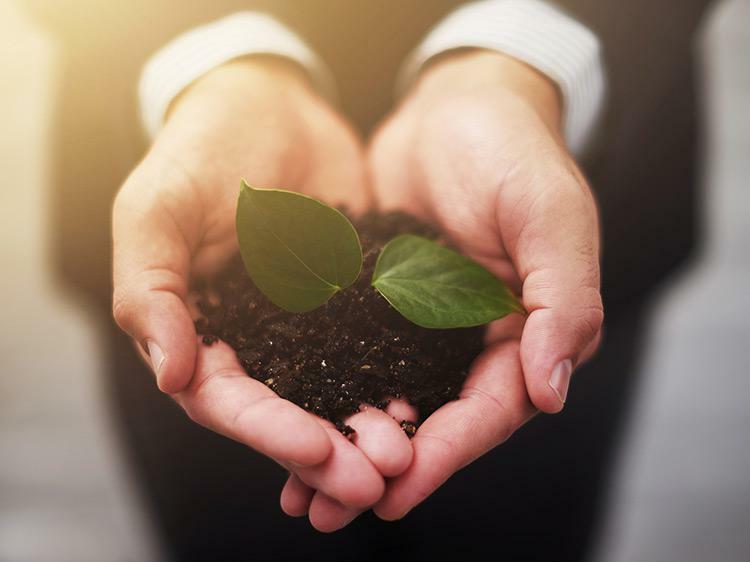 Some best-in-class employers understand the value of sustainability in the workplace and beyond—whether it’s through recycling programs, paperless communications, or energy conservation initiatives. Recently, Monster partnered with employee-review platform kununu to identify the workplace factors that workers rate as most important to their job satisfaction. Using kununu’s star rating system—1 (low) to 5 (high)—we identified the top companies with a 4-star rating or higher for environmental friendliness and then rounded up the jobs they’re hiring for on Monster. The winners are a diverse mix, including everything from Internet powerhouses to health systems. The best part: You don’t necessarily have to be the outdoorsy-type to work for the good of the Earth. At these companies, rather than wading through rivers or trekking through the jungle, instead, you might find yourself working under a solar-panel roof or LED lights, or maybe even helping pass environmental protection laws. But don’t just take our word that these companies care about the environment. Take it from the people who know best: current and former employees who left reviews on kununu’s site. See if you, too, want to go green at one of the companies below. What they do: Amazon provides e-commerce and cloud computing services. Why they’re on the list: There is a “24/7 policy of eco-consciousness and awareness” at Amazon, where reviewers say, “they try to make as little impact [on the environment] as possible.” Amazon is diversifying its energy portfolio through large-scale rooftop solar systems on their fulfillment centers as well as by converting their lighting systems to low-emitting diode LED lighting, according to Amazon’s website. The e-commerce giant also has 10 renewable energy “farms” that power electricity for their data centers. Find all jobs at Amazon on Monster. What they do: Aptive Environmental provides pest control services in 24 states. Why they’re on the list: Protecting the environment is of the utmost importance at Aptive. As an industry leader, the company’s main goal is to provide pest control solutions that reduce health risks to humans and the environment. They’ve even partnered with the United Nation’s Nothing But Nets campaign to help stop the spread of malaria, according to the company’s website. Find all pest control jobs on Monster. What they do: Philips health system is comprised of hospitals and health care centers across the country. Find all health care jobs on Monster. What they do: Dynamic Dallas Solutions is a marketing consultancy that provides high-impact business development programs around leadership training, inventory control, and other aspects of running a company. Find all business development jobs on Monster. What they do: Google is a tech company that specializes in online advertising, search, cloud computing, software, and hardware. Find all jobs at Google on Monster. What they do: Citibank provides commercial and consumer banking and financial products and services. Why they’re on the list: Reviewers say Citibank is “always looking for ways to save energy and help with the environment.” The company recently announced a $100 billion, 10-year commitment to finance sustainable growth, according to their website. Not to mention, the financial group plans to be 100% powered by renewable energy by 2020, already boasting a fully green building. Additionally, reviewers at kununu say Citibank has community volunteer days as a way to be more eco-friendly. Find all jobs at Citibank on Monster. What they do: Dubbed the “birthplace of public higher education in America,” the University of Georgia is a public research university, comprised of 17 schools and colleges. Why they’re on the list: According to the school’s website, UGA “is improving the world and addressing grand global challenges through better local solutions.” Named a Green Ribbon University by the U.S. Department of Education, UGA has reduced waste and water and energy usage significantly in the past decade through things like rain gardens, LED lighting, and bike paths. Additionally, the university plans to continue to promote sustainability by converting its bus transit system to electric vehicles. Find all jobs at University of Georgia on Monster. What they do: UnitedHealth Group is a health system comprised of hospitals and health centers and provides insurance and information technology services. Find all jobs at UnitedHealth Group on Monster. What they do: GAO is a legislative branch government agency that provides auditing, evaluation, and investigative services for Congress. Why they’re on the list: GAO has an entire Natural Resources and Environment team dedicated to supporting Congress as it considers bills related to the Earth. By providing fact-based analyses on issues related to sustainability and environmental efforts, including energy supply, land and water resources, environment protection, food safety, and agricultural programs, GAO helps Congress pass legislation to make the world a better place. Find all government jobs on Monster. What they do: Wegmans is a family-owned supermarket chain, with 94 stores based in New York, New Jersey, Pennsylvania, Maryland, Virginia, and Massachusetts. Why they’re on the list: While reviewers say recycle bins abound at Wegmans (Not to mention, “they try to ensure that staff use [the recycle bins] appropriately as role models for the customers.”), the supermarket does so much more for sustainability. To name a few, Wegmans, according to its website, also supports local food banks, employs solar panels at several locations, uses compressed natural gas fuel in the trucks at its Pennsylvania distribution center, utilizes LED technology, makes use of natural refrigerant technology, and diverts half of its waste from landfills. Find all jobs at Wegmans Food Markets on Monster. The Monster-kununu Workplace Happiness Index includes industry data provided by kununu from August 2016 to July 2017. Reviews on kununu are broken down into 18 key dimensions of workplace satisfaction with each dimension assigned a star rating. The above information takes into account the average of those ratings over a 12-month period. Only companies with a minimum of 10 reviews were considered. Want to help other people choose a career or employer? Rate your company on kununu.